That Sunday morning, we were confused whether to go to Hampi or Anegundi since we had only half a day at our disposal and the long distance between our resort and Hampi was also a factor . So,we decided to explore Anegundi . On driving towards Anegundi ,one milestone made us very curious as it read Cave paintings and directions for the same were given . We traveled in the direction given but failed to locate the place. We came back to the main road from where we had taken the deviation . We inquired about the cave paintings to a local shop keeper . He kindly obliged and arranged us an auto driver as our guide to this place . 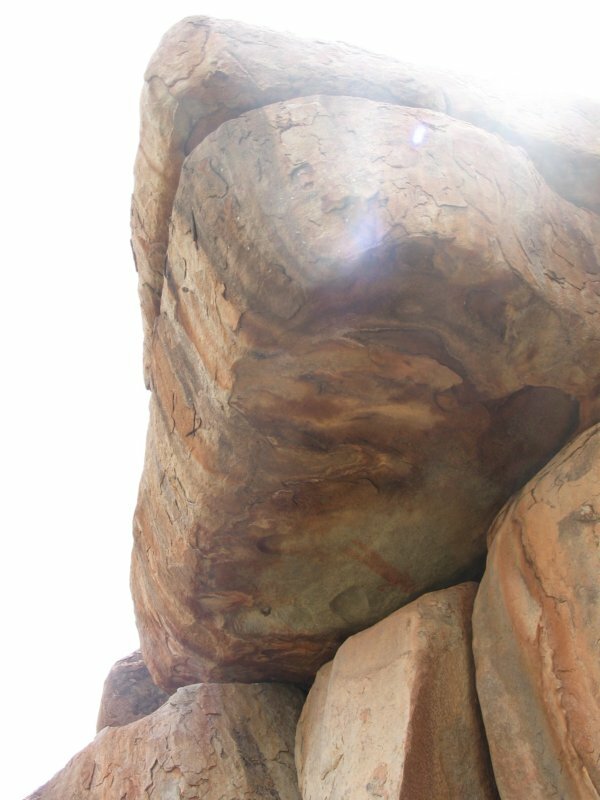 On reaching this place, we realised it would be impossible to find it without a local guide. But, looking at the place we wondered where the caves were because all we could see were paddy fields on boulders. We walked through the paddy fields and reached the gate which was locked. On seeing us, the guard who had the keys came by to open the gate for us. We thought the government was in charge of this place but later on inquiring we came to know it was owned by a private party . After entering the gate. we walked a long path which had turned into marsh due to the continuous downpours . Finally both our guide and guard showed us the paintings and they were unbelievable. 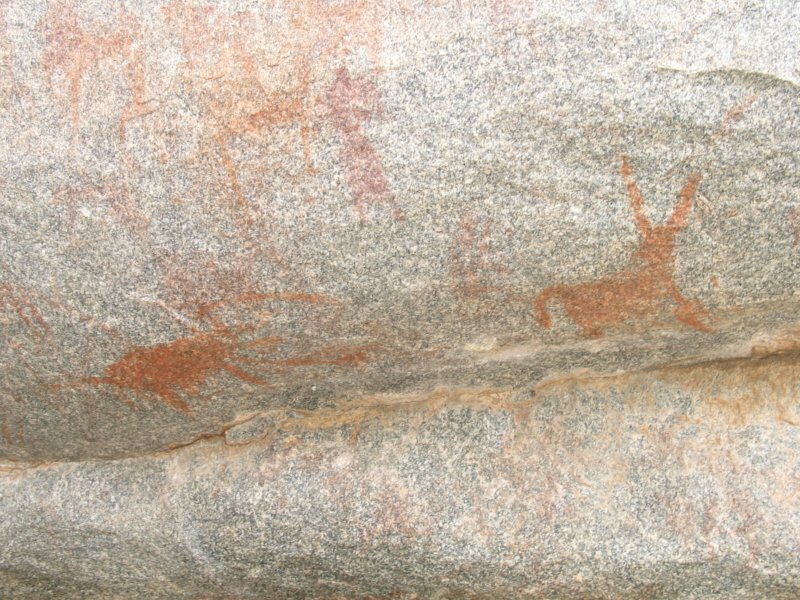 Mainly, it had paintings of various animals the pre historic men saw , the hunting scenes , and of men and women. 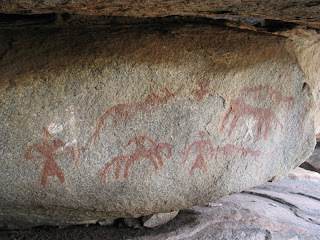 The above painting probably describes a hunting seen and shows the pre historic men used a bow and arrow type weaponry and rode on animals like horses for hunting. 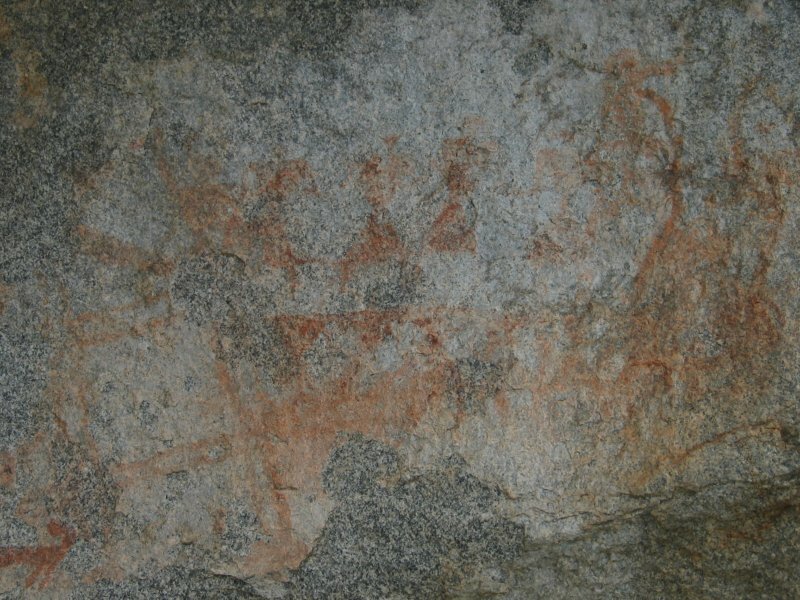 Careful observation of the above painting shows that it is of a man. The most interesting part of this painting is probably the place where it is painted. We wondered how they painted at such a height ( almost 15ft high from the ground, second pic is indicates the height). This Painting contains a large number of animals and various scenes of hunting . This is a painting of a huge snake and the largest of all paintings we saw here . 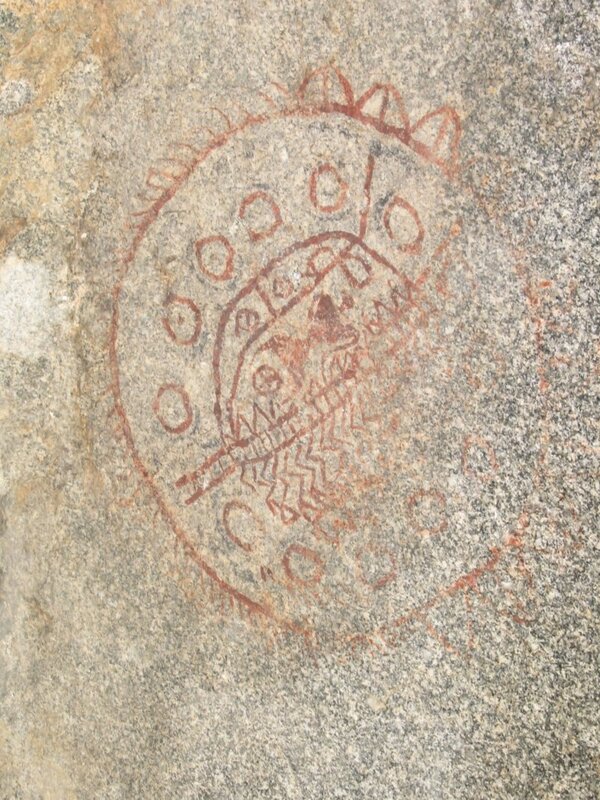 The above painting contains a crab/scorpion and a dog like animal . This is the painting of a bird carrying three people on its back and is truly amazing . Few believe that this could have been an imaginative painting , where as few others believe that the men saw god flying in this manner . This is probably the most unique painting belonging to this site which is probably not found anywhere else of this kind. 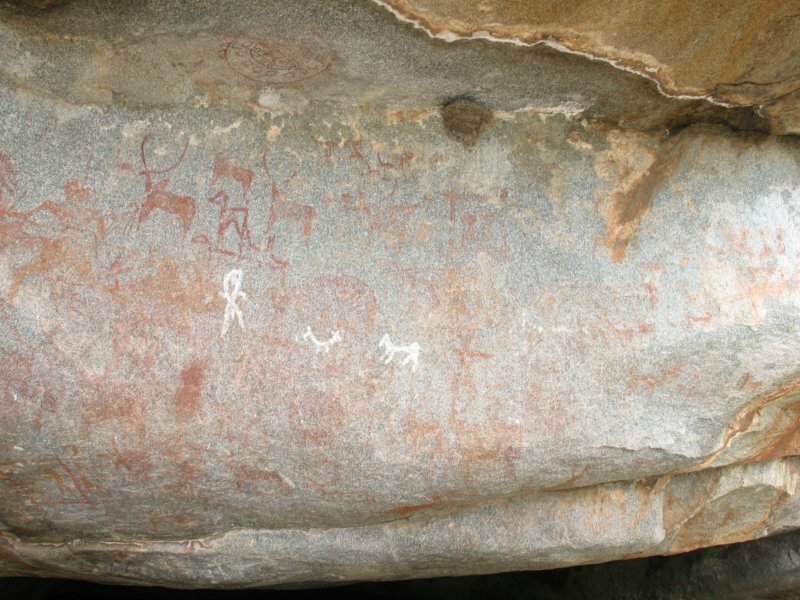 Most of the other paintings bear a resemblance to various other sites across India . The initial belief was that this was a "Megalith Burial Site " with dead people at the centre. 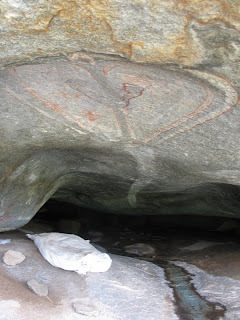 But, a recent article published in the Bangalore Mirror dated Dec 28 2010 ,titled " Prehistoric man drew Maps " , suggests that this is not megalith burial site but a map depicting the physical features of the area . The archaeologist T M Keshava and his team suggests that the paintings were made using red laterite clay and is almost 4000 yrs old . This was a wonderful experience for us since we did not expect such an interesting place during our trip. Though the exact meanings of the paintings are a real mystery , we can only create meaning to suit today's world. Why they painted? What it really means? Was it for communication purposes? There are many more unanswered questions. Thanks to this place. It really made our trip a memorable one . It took away all the pains of our journey (read about it here ). Finally, we have to thank our kitten for making us rewrite the whole post again . This post has come out more informative than the earlier one. This place requires serious maintenance and urgent work has to be taken on preserving the precious paintings. 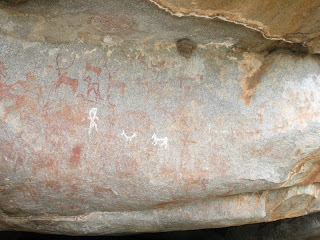 Whatever we saw was just a glimpse of the paintings since a lot more are believed to be present inside the caves and surrounding hills and are yet to be explored. This place is located very close to Anegundi in Gangavati . To visit this place, it is always better to hire a local guide at least for the first time . Most of the local auto drivers double up as Guides . There are a lot of places to visit around. A few to name are the Pampa Sarovar, Anegundi Fort , Anjanadri Hills ,Cave Temple ,Hampi, Reservoir, and the Durga Fort . Trip date : 3rd Oct 2009 and 24th April 2010. Those are incredible! And you did get terrific captures! What a fascinating post for the day! Thanks for sharing your adventure! Interesting and a great post. 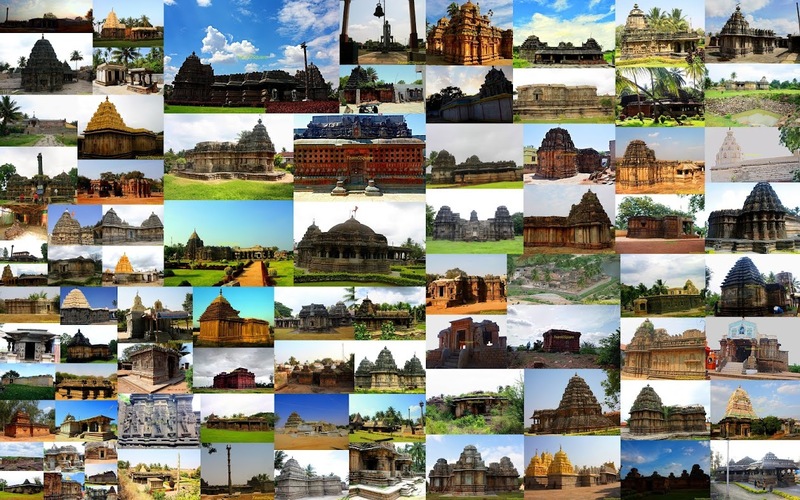 I have plans to visit Hampi (don't know when..(lol)) and this gets added to my wish list too. These truly are incredible! You certainly had some adventure man. Totally loved it! I would certainly look up to it if I am ever again in that part of the country. How wonderful you could visit these sites ! Hope they are well protected . 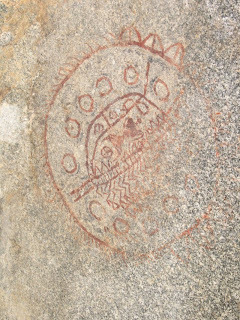 We missed this on our trip to Hampi because though we had gathered some information about the paintings beforehand, no one could guide us properly about where to find them. Beautiful shots of paintings. 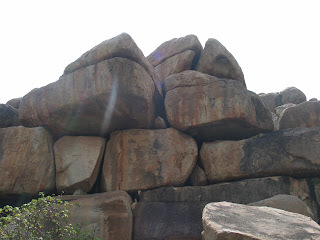 Had been to Hampi several times, but not here. Thanks for visit and comment. First time here. You have a beautiful space. Pic. are awesome. History etched out...nice. Never been to Hampi though! Very beautiful pics! The paintings look exquisite..
Great blog! Keep travelling and writing - that way the rest of us can learn about these interesting places which we may have otherwise never even heard of! Blessings! @ Yosee Madam , They are not at all protected. The white paintings do not represent Pre-historic paints. They are supposed to be drawn by the local peoples.